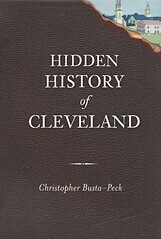 Cleveland Area History: Cleveland's Identity: Your Contributions! For your Friday reading pleasure, here are two of your contributions to our ongoing call to Help Define Cleveland's Identity. Cleveland’s identity shapes and reflects our place in time. Regional landscape (place) is always in flux. The forces of change play out in historical cycles (time), each with a beginning, climax and end. Each new cycle remakes the place. Deep History. As pioneers, Cleaveland et al. stepped into a naturally structured place: a glacial cycle had recently remade an older sea bottom bedrock landscape. To the old rocks the glacial remake brought complex new ridges, valleys, lake and biota. Present. Cleaveland et al. imported a contemporary Industrial Revolution (IR) identity. With it, Clevelanders could ‘exploit place resources’ in support of manufacturing: bedrock for building platforms, ridges and valleys for transport, lake for transport and sewerage, etc. The cycle is essentially played out; the landscape is now Rust Belt; identity is adrift and searching. Future. In forcing a more biocultural cycle, Clevelanders may identify more with place and time. We may learn how to ‘live with place/time features.’ Emerging place/time-conscious institutions are positive identity shapers: CVNP (environmental/historical preservation, local agriculture), GCBL (bioregion awareness/innovation), CAH blog (identifying forgotten early IR buildings). The task is to identify in learning about and living with our place in time. problem, and people have grown increasingly jaded and hardened. only reason we wouldn't is because we tell ourselves that we don't. Want to take a stab at defining Cleveland's identity in 200 words or less? Email us at clevelandareahistory [at] gmail [dot] com. Great article and really agree on the second reader's comments. Going to cleveland.com's comments section is just some really masochistic stuff! People in the area seem to foster the "loser mentality", finding the negatives in even the most positive stories.